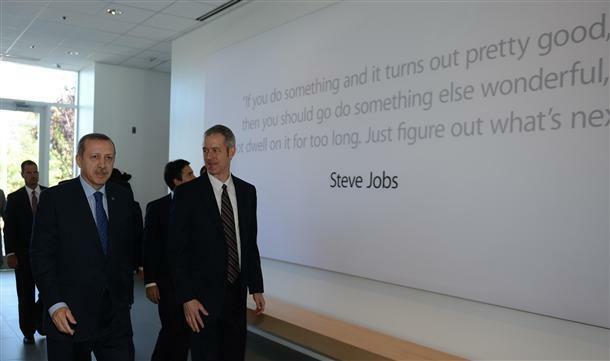 Ahead of a planned purchase of more than 10 million tablets, Turkish Prime Minister Recep Tayyip Erdoğan visited Apple's campus to hear the company's pitch for the iPad's use in education. In the course of a visit to the U.S., Erdoğan visited Apple, Microsoft, and Google according to Turkish blog ElmaDergisi. Erdoğan's tour is meant to boost Turkey's FATIH project, launched by the prime minister to integrate modern computing technology into Turkey's public education system. "We wanted to see the latest developments in the information technology sector before we launched the FATIH bid," Erdoğan said. "Our first aim is to produce 10,600,000 tablets as part of the FATIH project." Following the initial phase of the FATIH  which is a Turkish acronym for Movement of Enhancing Opportunities and Improving Technology  the Turkish government may purchase another two to two-and-a-half million tablets. The project will span about four years, with a cost of between $3 and $4 billion dollars. Turkey's Education Ministry intends for those 10.6 million tablets to replace traditional blackboards and textbooks in schools. Turkey will render a decision on the tablet purchase contract some time this month. Apple has long positioned its computers as ideal for education, and since the introduction of the iPad, the company has redoubled those efforts. The popular tablet has seen considerable interest from educators in the United States, and analyses from last year showed the iPad definitively cutting into PC sales in the education sector.